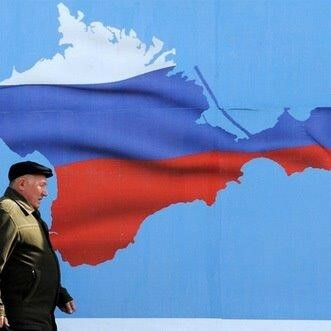 Russia on Monday redrew its official maps to include Crimea after annexing the peninsula, even though the move has not been internationally recognized. Maps on the Kremlin and government websites include Crimea, describing it as the “youngest region of Russia.” Russia’s absorption of Crimea has drawn international condemnation and sparked the worst East-West crisis since the Cold War. Russian troops have seized Ukrainian military bases on the mostly Russian-speaking region of two million people since a March 16 independence referendum. Several of Russia’s most popular websites including the main search engine, Yandex.ru, have also changed their maps. But on a parallel site for Ukrainian users, Yandex.ua, it continued to show Crimea as part of Ukraine. Yandex, which is based in Moscow, wrote on its official blog last week that “maps will be different for different countries. That is Crimea will be shown according to the official position of each country.” Yandex said it would also change the way it presented news, with stories about Crimea being classed as domestic news for readers based in Russia. The Russian language version of Google shows Crimea with a dashed border line, used for “disputed” boundaries. Russia’s biggest Internet company, Mail.ru, was one of the first sites to change Crimea to part of Russia on March 21, the day that President Vladimir Putin signed the agreement absorbing the peninsula. Russia’s television channels have for several days included Crimean towns in their national weather broadcasts. Sandy. No, the other one. The Island. An intrepid team of Aussie researchers set out to find the prize of explorers for centuries, undiscovered lands. In this case, it was a small-ish island shown on some maps as lying between Australia and New Caledonia. There was some disagreement as to whether the island even existed. You see, some maps showed it, including Google, while others did not, like nautical charts. Which was right? Why were there no records of inhabitants on this island or previous landfalls? Could this be where Amelia Earhart landed? Or where all those missing from the Bermuda Triangle were transported? Of course not. That’s because the island doesn’t exist. When the ship arrived at the place that was supposed to be an island, all they found was water. About 1400 feet deep of the stuff. When asked, Google merely said that the World is a constantly changing place, so maybe it sunk, or something to that affect. All we could surmise was that the grant that the Aussies had was specifically to pay for a boat expedition. It would have been too fast to consult satellite imagery or too easy to fly a plane over the area. Had to be a boat. Hope they went fishing too. United Nations News Centre – UN court rules Colombia has sovereignty over islands claimed by Nicaragua. If you have ever wondered if or why hurricanes follow a similar pattern from one to the next, check out this article on the Maps.com blog posted from the Geography in the News archives called Hurricanes Tracking Hurricanes. Click here to learn more. What does the Coriolis Effect have to do with Hurricanes? Today’s entry in our Hurricane Week series comes from our Classified Concepts blog. Check it out. Ever wondered what the Coriolis Effect has to do with hurricanes?Well, it is NOT that phenomenon that makes water go down the toilet clockwise in the Northern Hemisphere, and counterclockwise in the Southern. The devastation of the U.S. Gulf Coast by hurricanes Katrina and Rita has captured the media’s attention for weeks. Even as New Orleans and the impacted Gulf Coasts of Alabama, Louisiana, Mississippi and Texas begin to recover, questions are being asked about the characteristics of hurricanes and similar storms. A reader of Geography in the News recently wrote asking about the rotation of storms. He said he knew that winds around low pressure cells in the Northern Hemisphere rotate counterclockwise, but did not understand how the Coriolis effect was involved in all wind circulations. Sailors have long recognized that wind directions are deflected, seemingly by some invisible force. In 1835, however, French mathematician Gaspard G. Coriolis first described the phenomenon. Originally, it was called the Coriolis force, but the more recent and more accurate name is the Coriolis effect. The result of the Coriolis effect is that wind directions in the Northern Hemisphere are deflected to the right, while those in the Southern Hemisphere are deflected to the left. The cause of the Coriolis effect is the earth’s rotation. As a simple example, a hypothetical airplane leaves the North Pole on a 12-hour trip flying directly south toward Quito, Equador, located on the equator (80 degrees west longitude). During this 12-hour trip, the earth would rotate half way around and the plane would arrive in Sumartra, Indonesia (100 degrees east longitude). Clearly, from the ground, the plane’s direction was due south, but the earth’s rotation beneath the plane’s flight path created the illusion of the plane flying southwestward—a deflection to the right (from the plane’s origin at the Pole). No matter which direction air moves in the Northern Hemisphere, the earth’s rotation causes it also to be deflected to the right for the same reason. A simple experiment used by geography teachers is to cut a circle of cardboard, punch a hole in its center and place it on a pencil. While spinning the cardboard disk counterclockwise to simulate the rotation of the Northern Hemisphere, the demonstrator can attempt to quickly mark a straight line on the disk with a marker. Regardless of the direction attempted, the mark will always turn to the right. Turn the disk over, rotate it clockwise to simulate the Southern Hemisphere and the mark will always turn to the left. Winds blow from high to low pressure. These winds attempt to move in a straight line, but are always deflected by the Coriolis effect. For example, as wind moves toward a low pressure center, as with a hurricane, its direction is altered so that as wind crosses each isobar surrounding the low, it must cross to the right of a right angle. The cumulative effect causes the hurricane to circulate counterclockwise. Although this counterclockwise motion may seem counter intuitive, it makes perfect sense by standing at the wind’s origin and realizing that the deflection is causing the wind to cross each isobar to the right, rather than at a 90 degree angle. If it were not for the Coriolis effect, the wind would blow straight into the eye of a hurricane and there would be no circulation. Conversely, as wind blows out of a high pressure cell, it also must cross isobars at right angles. Putting one’s self at the origin, or the center of the high pressure, it is easy to realize that high pressure cells circulate clockwise in the Northern Hemisphere. Wind direction, then, can indicate many things to those who closely monitor the weather, even novice weather forecasters. A conclusion called Ballot’s Law says that if you face directly downwind in the Northern Hemisphere, the center of a low pressure cell should be located somewhere to your left. This accounts for the counterclockwise rotation of storms, such as hurricanes and other low pressure cells. For weekly Geography in the News analysis and thousands of maps, activities, lesson plans, videos and more register for a free trial on maps101.com. IS NO PLACE SAFE FROM HURRICANES? Our Thursday topic in our series of Hurricanes Week features is another great Geography in the News article from our archives called Is No Place Safe From Hurricanes, from Dr. Neal Lineback. The information is as relevant today as it was when it was first published. Read on. With coastal development booming along the Atlantic and Gulf coasts, we need to be reminded that hardly any coastal location in this region is safe from hurricanes. However, even hurricanes Katrina, Rita and Wilma aren’t likely to deter public interest in coastal property ownership and development. The accompanying map is a modified version of a highly detailed map published on the Web by NOAA’s National Climatic Data Center (NCDC) in Asheville, N.C. The NCDC map shows all of the 96 U.S. hurricane landfalls between 1950 and 2004 by name, date and Saffir-Simpson Category (1-5). The accompanying map generalizes much of the data and adds the five 2005 landfalls as of October 12, bringing the total to 101. Hurricane landfalls are the locations where the eye of a hurricane crosses a coastline from the water. Generally, the landfall site sustains the most direct damage from the eye of a hurricane, but the right side of the eye’s landfall is where wind and water tend to create the greatest damage from the storm’s counterclockwise rotating winds. Not only are these winds unimpeded as they flow onto the land from water, but they also tend to push water onto the land in a storm surge. The Saffir-Simpson classification system has been adopted by climatologists and meteorologists to provide five categories of hurricanes’ sustained winds. Category 1 is a fairly weak hurricane with sustained winds of 73-95 mph; Category 2 has winds of 96-110; Category 3 has 111-130; Category 4 has 131-155; and Category 5 hurricanes have sustained winds over 155 mph. Categories 4 and 5 storms cause extensive structural failures of roofs and walls and flooding of at least first levels of coastal buildings. North America’s hurricane season begins each year on June 1 and ends on November 30. According to NOAA, the Atlantic basin, including the Gulf, has had an average of six hurricanes per year and approximately five hurricanes strike the United States’ coastline between Texas and Maine over each three-year period. There were no hurricane landfalls in the region during the 2000 and 2001 hurricane seasons. The 1940s, 1950s, 1960s and 1990s were the most active hurricane decades in the Atlantic basin since the documentation began in the 1850s, but the current decade is proving be most active. Over the past 155 years, there was an average of 2.2 hurricanes per year in the Atlantic basin, or 22 per decade. Twelve decades had fewer than the average. The 1950s had 39 hurricanes, 1960s had 28 and the 1990s had 25 hurricanes. During the first five years of the 2000s decade, however, there have been at least 24 hurricanes and by October 12 of the 2005 hurricane season there had been 11 hurricanes in the basin, making this one of the two most active hurricane years on record. The geographic pattern of U.S. hurricane landfalls is interesting in that there are some clusters and some parts of coastlines relatively free of landfalls. Two clusters are evident in North and South Carolina’s exposed coastlines. Florida’s southeast coast stretching from Cape Canaveral to Key West has a distinctive cluster. Landfalls also are clustered from Florida’s western panhandle nearly continuously to south Texas. Long Island, New York, and coastal New England are sometimes exposed to hurricanes traveling northward along the East Coast. Between 1950 and 2005, Florida had the most numerous landfalls at 28, but it also has the longest coastline of any of the East Coast states and it sustained the most landfalls by Category 4 and 5 storms (4). Eighteen landfalls occurred in North Carolina, including Ophelia in 2005, where the Outer Banks are most susceptible. Because these low islands protrude into the Atlantic and have major bodies of water on both sides, overwash of these exposed islands from both sides can occur even with minor storms. Gaps between clusters of hurricane landfalls also are interesting. Florida’s west coast has had relatively few landfalls, except the recent one by Hurricane Wilma and only five others. But perhaps the most interesting gaps are found on Florida’s northeast coast and nearly along Georgia’s entire coastline. Accounting for this gap may be the westward indentation of the coast, similar to the coastlines of Virginia, Delaware and New Jersey. Geographic patterns of hurricane landfalls are of extreme interest to insurance companies, among many others interested in coastal development. Is there really any coastal location totally safe from hurricane landfalls? Maybe not. But a few places are certainly more vulnerable than others. Also follow our great Facebook sites: Geography in the News, Maps101 and our flagship page for Maps.com. The 2008 hurricane season has arrived. The tropical vacation destinations known as the Antilles are particularly vulnerable to these tropical storms and often bear the brunt of hurricanes that enter the Caribbean Sea. The Caribbean islands contain some of the Western Hemisphere’s most expensive vacation destinations. The region also has some of the world’s worst poverty. Hurricanes are a threat to all who live and vacation there from June through December. The Caribbean region consists of the islands and mainland surrounding the Caribbean geologic plate and the Caribbean Sea. This is one of the earth’s most active tectonic and volcanic regions. It formed more than 7,000 islands and islets in the Caribbean archipelago arc known as the Greater and Lesser Antilles. The Greater Antilles include Cuba, Hispaniola (Haiti and the Dominican Republic), Jamaica and Puerto Rico on the northern margins of the Caribbean. The Lesser Antilles consist of the smaller islands located along the eastern side of the Caribbean Sea and are further divided into the Windward and Leeward Islands. The topography of the islands varies greatly, from volcanic peaks on St. Kitts and Montserrat to relatively flat terrain on Aruba. There are 13 sovereign states, 12 dependent territories and two overseas departments (similar to states) in the Antilles. All of the Antilles are tropical, situated at latitudes where the trade winds blow almost continuously from the northeast, bringing warm, moist air to the windward sides of the islands. Mountainous terrain regularly experiences high rainfall amounts, providing fresh water and resulting in tropical rainforests growing on steep windward slopes. The name Caribbean derives from the Amerindian ethnic group called Caribs that occupied the Lesser Antilles and parts of the coastal mainland when the Europeans first arrived in 1492. The initial European explorers tried to force the Caribs to work in fields and mines. However, the original islanders were too independent and the majority of population was wiped out as European settlers seized their islands and brought African slaves to provide labor and grow sugarcane. The Spanish were the first Europeans to conquer and settle the Antilles. The French and British alternatively fought for control of the land. Even the Netherlands and United States vied for some of the islands. Today, the islands’ cultures are a polyglot of different languages, diets, house types, political systems, economies, laws and money. Hurricanes can bring exceedingly high precipitation, high winds and storm surges anywhere around the Caribbean region, particularly to Antilles. Large resort properties may sustain massive damage from a direct hurricane hit. Most islanders’ houses, however, are more fragile and can’t withstand hurricane-force winds. Nearly all of the Caribbean islands have hurricane evacuation plans and shelters. Tourists are evacuated and local residents, particularly those from coastal villages, are moved to reinforced hurricane shelters. Schools and public buildings serve as shelters and buildings designed specifically for hurricane events are being constructed. Most tropical storms that are or are destined to become hurricanes enter the Caribbean Sea from the northeast, riding in on the northeast trade winds. Consequently, the northeast sides of the islands are the first to experience the damaging effects. One example is Hurricane Georges, which pummeled St. Kitts and Nevis in 1998. Georges was one of the strongest hurricanes ever to strike St. Kitts. It damaged 85 percent of the local structures and totally destroyed 30 percent. Half of the island’s population of more than 30,000 was without shelter, food or water. Georges made more landfalls than any other hurricane in recent times: Antigua and Barbuda, St. Kitts and Nevis, Haiti, Dominican Republic, Cuba and the United States (twice). With the hurricane season here, Caribbean islanders will keep a wary eye to the northeast. Nobody wants another Hurricane Georges.